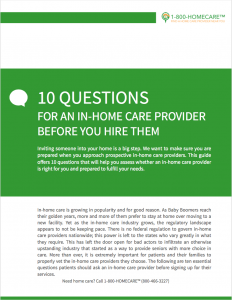 Access Guide: 10 Questions for an in-home care provider before you hire them. By clicking the button above, I agree to receive autodialed and pre-recorded telemarketing calls and texts from or on behalf of senior care companies, this website’s operator, CareInHomes™, and partner companies at the phone number provided above. I understand my consent is not a condition of purchase.